Background: Pregnancy termination due to fetal anomalies is associated with emotional, psychological, and social injuries for women. Determining the needs of women with these experiences is the key for programming to provide high quality and desirable care. Hence, the present study was conducted to determine the needs of women who have experienced pregnancy termination due to fetal anomalies. Materials and Methods: The present literature review was conducted in March 2018 by searching databases such as Irandoc, SID, MagIran, Iranmedex, Cochrane, Science Direct, ISI Web of science, PubMed, Google Scholar, and Scopus. The used keywords for the search included “fetal anomalies,” “pregnancy termination due to fetal anomalies,” “therapeutic abortion,” “need assessment,” and “care program.” Publication date was restricted to 2004–2017, and publication language was restricted to English and Farsi. Article search was conducted by two independent reviewers, and all of the studies were evaluated by these two individuals. 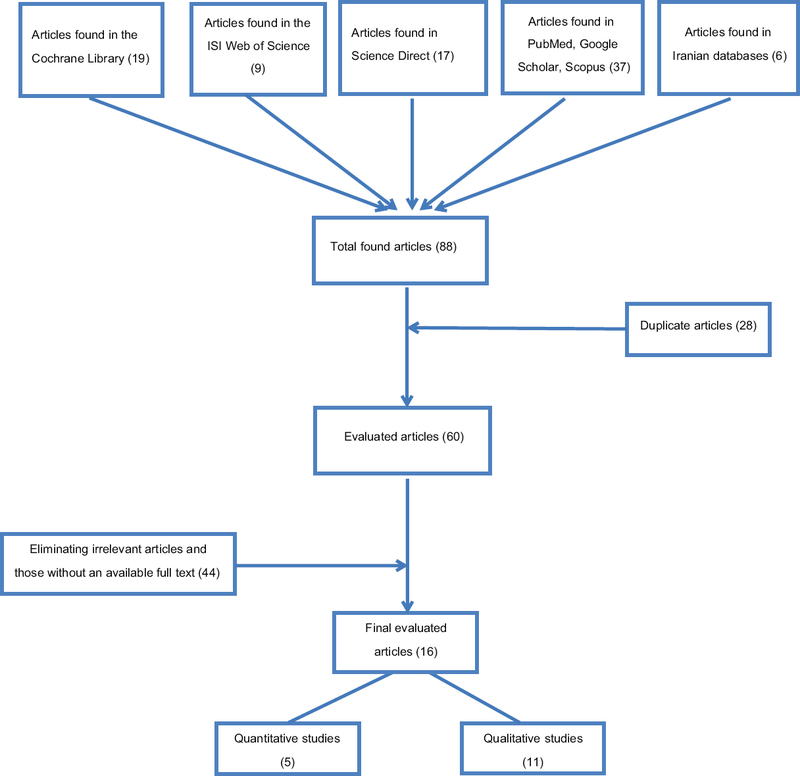 The searches resulted in finding 88 articles related to the subject from which 16 articles that had more appropriately covered the topic were selected for the present study. Results: From the results, the needs of these women could be categorized into two groups of “needs related to the care system” and “needs related to the husband, family members, friends, and peers.” Conclusions: Considering that women who have experienced pregnancy termination due to fetal anomalies have different needs, educating healthcare providers and husbands, family members, friends, and peers for providing comprehensive care tailored to the needs of these individuals seems necessary. Background: The ability to comprehend a text depends primarily on the knowledge about its words. This study investigated the most frequent words in high impact factor (IF) English nursing journals. 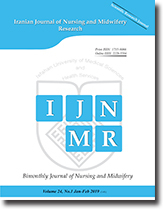 Materials and Methods: This corpus-based study was conducted on the articles of 13 English nursing journals with an IF of over 0.7 from November 2014 to September 2016. After the typographical errors were corrected and the tokens (running words) in each journal were equalized, the tokens were analyzed using the Range software. Finally, a word list was extracted from the final 2851 articles and 8196,953 tokens to reach the optimal 98% vocabulary coverage. Results: A word list consisting of 1081 word families and 3175 word types with 5.24% coverage was extracted, which fulfilled the 98% vocabulary coverage. In other words, the coverage of the 1081 word-family list (5.24%), the coverage of the 1st 3000 English word families (87.55%), proper names, marginal words, compound words, and abbreviations related to the software (3.29%), and the coverage of the new proper names (1.13%), new compounds (0.02%), new abbreviations (0.72%), and letter–number combinations (0.05%) totaled 98%. Conclusions: By learning the 1st 3000 English word families and the 1081 word families introduced in this study, a nursing student can comprehend the texts of articles in high IF nursing journals without any considerable help from other resources. Background: Becoming a father challenges men's ability and many men describe fathering as a negative and frustrating experience. This study was designed to determine related factors to paternal adaptation in first-time fathers. Materials and Methods: This cross-sectional study was conducted in healthcare centers in Qom and environs, Iran, from July to September 2015. Participants were 572 first-time fathers. Healthcare centers were selected by lottery and sampling was carried out continuously. Data were collected by demographic form and Paternal Adaptation Questionnaire; Spearman's correlation coefficient, Mann–Whitney and Kruskal–Wallis test, and multiple linear regression model were used. p < 0.05 was considered as significant level. Results: Participants were first-time fathers with a mean (SD) age of 29.89 (4.45) years. The results indicated that planning for parenting is the most predictive factor in the ability to perform the paternal roles and responsibilities (β = 2.67, p < 0.001); marital satisfaction is the most predictive factor with regard to perceiving parental development (β = 3.09, p = 0.001) and stabilization in paternal position (β = 4.66, p < 0.001). Father's self-employment was the only predictive factor relating to challenges and worries (β = −1.19, p < 0.001) and marital satisfaction was the most predictive factor for paternal adaptation (β = 14.68, p < 0.01). Conclusions: It appears that the father's occupation, planning for becoming a parent, and marital satisfaction are the most predictive factors for paternal adaptation and its domains, thus by planning appropriate interventions aimed at developing the ability of fathers in these aspects, especially marital satisfaction, it is possible to facilitate men's adaptation to paternal role. Background: Pulse oximeter is a simple and noninvasive standard device to monitor the saturation of peripheral oxygen (SpO2) and heart rate. The nail polish of different colors may result in inaccurate oximetry reading and interpretation of oxygen saturation. This study aimed at determining the effect of different colors of glittered nail polish on SpO2in healthy students. Materials and Methods: This is a randomized clinical trial on 30 healthy students with SpO2≥95% and without any complications on nail beds and environmental perfusion. SpO2was measured on 10 fingers of the participants after sitting and resting on a seat for 10 min in a room with normal temperature. Then they were asked to apply 10 colors of glittered nail polish randomly to their fingernails as all colors were used. After drying the two-layer nail polish, SpO2was measured again. Results: Of 10 glittered nail-polishes, dark green and purple did not change SpO2reading significantly. All other colors lowered SpO2significantly based on Wilcoxon test (red: p = 0.003; orange: p = 0.002; yellow: p = 0.015; pink: p = 0.017; dark blue: p = 0.001; violet: p = 0.001; brown: p = 0.001; black: p = 0.001). However, those changes were not clinically significant because SpO2differences before and after nail polish were in acceptable range (less than a 2% change). Conclusions: We conclude that different colors of glittered nail polishes do not result in a clinically significant change in pulse oximetry measurements in healthy subjects; therefore, it is not necessary to remove the glittered nail polish routinely in clinical, surgical, and emergency settings. Background: Sleep problems and depression are issues that can be addressed as far as nurses are concerned. This study aimed to investigate the role of workaholism in predicting the sleep problems and depression among Iranian nurses. Materials and Methods: we used the cross-sectional analytic research and correlational research design. Two hundred and forty-seven nurses in Malayer participated, based on the census method, in this study, that began in January and ended in March, 2017. Workaholism scale, sleep problem scale, and Short Form of Beck's Depression Inventory were used to collect the data that were finally analyzed by independent sample t-test, Pearson correlation coefficient, and hierarchical multiple regression tests. Results: About 13.77% of the nurses were workaholics, and 17.83% had mild–moderate depression. The main sleep problems were difficulty in starting sleep (44.53%) and extreme daytime sleeping at work (40.48%). The effect of marital status on workaholism (t = 1.99, p < 0.05) and depression (t = −2.55, p < 0.01), the effect of educational status on sleep problems (t = 3.08, p < 0.002), and the effect of occupational ward on workaholism (t = 2.06, p < 0.04), sleep problems (t = 4.83, p < 0.001), and depression (t = 1.99, p < 0.05) were statistically significant. Workaholism was positively correlated to sleep problems (r = 0.19, p < 0.003) and depression (r = 0.13, p < 0.04), working excessively (F = 22.75, p < 0.001), working compulsively (F = 21.00, p < 0.001), educational status (F = 7.25, p < 0.03), and occupational ward (F = 9.29, p < 0.001) were also shown to be significant predictors of sleep problems, age (F = 7.11, p < 0.001) and job experience (F = 7.19, p < 0.009) turned out to be the significant predictors of depression. Conclusions: Attention to psychological strategies to reduce the nurses' workaholism level plays an important role in decreasing such psychological problems as sleep problems and depression. Background: Considering the important role of education and the benefits of peer education in increasing patients' independence in self-care, as well as the socio-economic benefit of using peer education, the present study was conducted to assess the effect of peer education on the quality of life (QOL) of elderly people with diabetes. Materials and Methods: This clinical trial was conducted with 44 diabetic people aged over 65 years in selected health centers of Isfahan, Iran, in 2014. After preparing the peer group, 8 educational sessions were held for the participants of the groups by their peers (intervention group) and by the researcher (control group). The Diabetes Quality-of-Life (DQOL) measure was used to assess their QOL before, immediately after, and 1 month after the intervention. 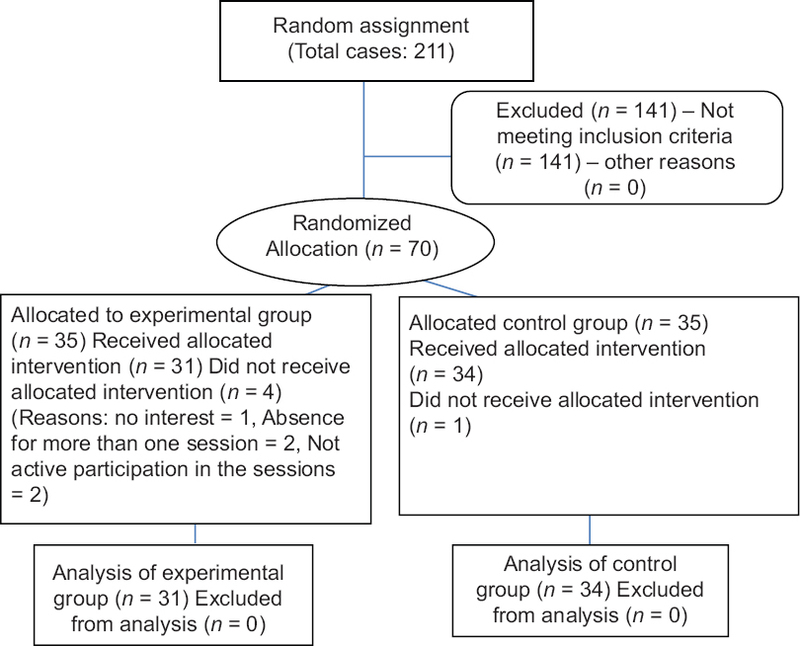 Results: The difference between the groups in terms of the total quality of life score immediately after the intervention was significant (t = 8.63; p = 0.001). The results showed that the QOL score in the dimensions of worries about diabetes effects (t = 12.13, p = 0.042), impact of diabetes treatment, (t = 8.63, p = 0.001), and satisfaction with diabetes treatment (t = 11.33, p = 0.001) was significantly different in the groups immediately after the intervention. Conclusions: Peer education increased the QOL of patients with diabetes, with significantly better results than the researcher training group immediately after the training. Thus, this method can be used to improve the QOL of the aged population. Background: One of the factors affecting the behavior and performance of nurses is mental workload. Training programs can improve the attitude, knowledge, and performance of nurses. However, the impact of these programs on mental workload is not clear. Therefore, the study aimed to evaluate and compare the effect of two conventional and self-designed education classes on the mental workload of neonatal intensive care unit (NICU) nurses. Materials and Methods: This study was conducted on 68 nurses, divided into two intervention and control groups. Subjects of the intervention group attended a social awareness reinforcement class, in which one of the dimensions of emotional intelligence was introduced and covered. Research tool was the mental workload questionnaire of National Aeronautics and Space Administration Task Load Index (NASA-TLX). Results: In this research, results of the paired t-test were indicative of a significant decrease in the mean score of mental workload immediately after the intervention (t = 1.48, p < 0.001) and one month later (t = 1.11, p = 0.007). Moreover, a significant difference was observed in the mean score of mental workload of the intervention group between before and after the conventional education class, and before and 1 month after the self-designed class using repeated-measures analysis of variance (F = 21.31, p < 0.001). Conclusions: According to the results of the study, the conventional education class had no impact on the mental workload, whereas the self-designed class significantly decreased mental workload. Therefore, it is suggested that education programs be conducted for NICU nurses to improve their emotional intelligence, which leads to decreased level of mental workload. Background: In Iran, futile care has become a challenge for intensive care nurses. The aim of the study was to develop a tool for assessing the reasons of futile care at intensive care units (ICUs). Materials and Methods: A sequential mixed method in three stages was applied. In the first stage, a phenomenological study was performed with van Manen's method by interviewing 25 nurses at ICUs of 11 hospitals in Qazvin. To extract the items of the tool in the second stage, the concept of futile care in ICUs and its reasons were defined. Ultimately, the psychometric properties of the questionnaire were evaluated with face validity, content validity (quantitative and qualitative), construct validity (exploratory factor analysis), internal consistency (Cronbach's alpha), and test–retest reliability. Results: The initial tool had 119 questions. After validation, 39 items remained in the final questionnaire. Five extracted factors were as follows: professional competence (14 items), organizational policy (9 items), socio-cultural factors (7 items), personal beliefs and values (4 items), and legal issues (5 items). Cronbach's alpha for the whole questionnaire was 0.91 (range: 0.71–0.96). The test–retest reliability was 0.87 (p < 0.001). Conclusions: Nursing managers and clinical nurses can use this tool to identify the causes of futile care and reduce it in their clinical settings. Policy makers can use this tool for improving the management of ICUs. Background: The early years of life have an important role in children's growth and development, and training during this period will play a pronounced role in their whole life. Behavioral problems (BPs) that children showed at this age have been a growing concern for those involved in pediatric health. The aim of this study was to compare the effectiveness of puppet show and storytelling methods on BPs among preschool children. Materials and Method: This quasi-experimental study was conducted on three groups (puppet show and storytelling as test groups and a control group), in three stages, using a pretest–posttest design. The study was conducted in 2014 on 75 children age 3–5 years selected from three kindergartens in Isfahan, Iran. The subjects were selected using random clusters sampling method. To collect data, Shahim Preschool Children Behavior Problem Questionnaire was used. 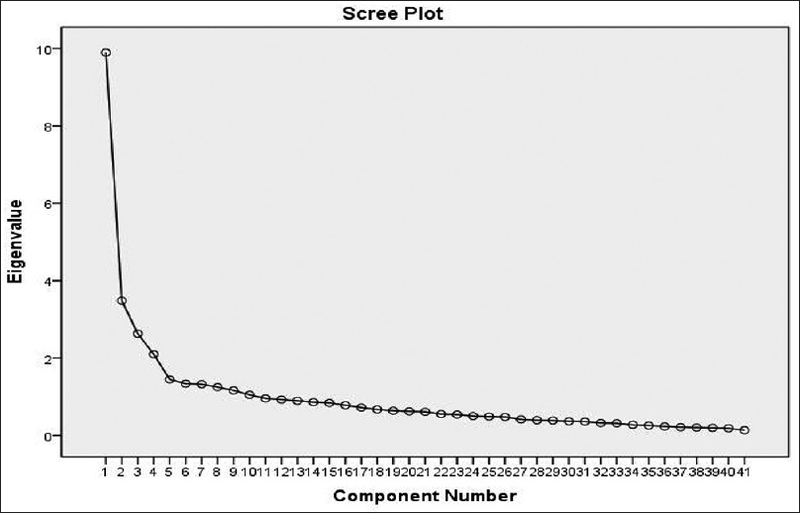 Data were analyzed using descriptive and inferential statistics in SPSS software. Results: The results of the statistical tests including one-way analysis of variance (ANOVA) and repeated measures ANOVA test showed that mean variation in both puppet show and storytelling groups was significantly higher than the control group immediately and 1 month after the intervention (p < 0.001). 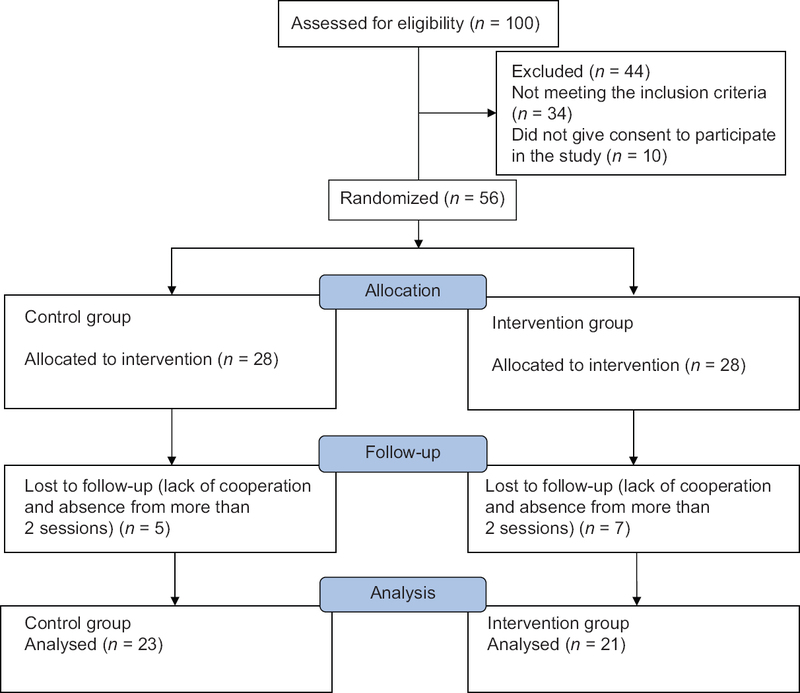 Variation was significantly higher in the puppet show group compared to the storytelling group immediately (F = 222.5, p < 0.001) and 1 month (F = 235.5, p < 0.001) after the intervention. Conclusions: It can be concluded that compared to the storytelling method, the puppet show method has a greater impact on improving behavior problems among preschool children. Background: Identifying the status of clinical education helps to improve the achievement of educational goals. This study aimed to compare the achievement of clinical skills in the final year nursing students. Materials and Methods: In this descriptive analytical study, 157 nursing students in the seventh and eighth semesters were selected through a census method, who were compared with each other. Data were collected using a researcher-developed questionnaire that included 111 clinical skills in 7 dimensions of primary nursing care, vital signs control, oxygenation and airway management, medication administration, laboratory samples collection, infection control, and cardiopulmonary resuscitation skills. Students scored each skill on a scale ranging from 0 to 5. The acceptable skills level in this study was the third level, which observes skills performed by the instructor or the nurse. Data were analyzed using the Kolmogorov–Smirnov test, descriptive statistics, and multiple linear regression. Results: In the seventh semester students, except for the vital signs skills, other skills were at lower than expected levels. In the eighth semester students, except for the laboratory samples collection and infection control skills which were at a lower than expected level, other skills were reported at expected levels. Multiple linear regression showed that the eight semester students had more total score than the seventh semester students (t = 3.19, p = 0.002). Conclusions: The provision of sufficient opportunity to develop clinical skills in the eight semester was observed in this study; therefore, it is recommended that the internship course be increased in the dimensions in which students can independently perform clinical skills. Background: Health literacy can be considered as a factor affecting healthcare providers' decision-making. The aim of this study was to investigate health literacy status and its relationship with quality of life among the nurses working in teaching hospitals affiliated with Shiraz University of Medical Sciences in Iran. Materials and Methods: This cross-sectional study was conducted in 2017. To this end, 185 nurses from hospitals were selected by stratified random sampling. The data collection instruments included the standardized Health Literacy Questionnaire and the 36-Item Short Form Health Survey. The data were analyzed through descriptive statistics as well as t test, analysis of variance, Pearson correlation coefficient, and multivariate linear regression analysis using SPSS23 (α = 5%). Results: The mean scores for health literacy and quality of life were 70.06 (12.98) and 60.86 (17.26), respectively. A significant relationship was observed between the health literacy and quality of life (p <0.001), Access (p = 0.004), reading skills (p = 0.004), understanding (p = 0.016), and application of health information (p = 0.012) as the dimensions of health literacy were identified among the predictors of quality of life. In addition, there was a significant relationship among age (r = 0.22, p = 0.008), work experience (r = 0.27, p = 0.002), and employment relationship (F = 3.89, p = 0.005) and the mean score for nurses' health literacy status. Conclusions: A significant relationship was observed between health literacy and quality of life in nurses. Healthcare policy-makers are suggested to take measures to develop programs on promoting health literacy and related skills to improve the status of quality of life among nurses.